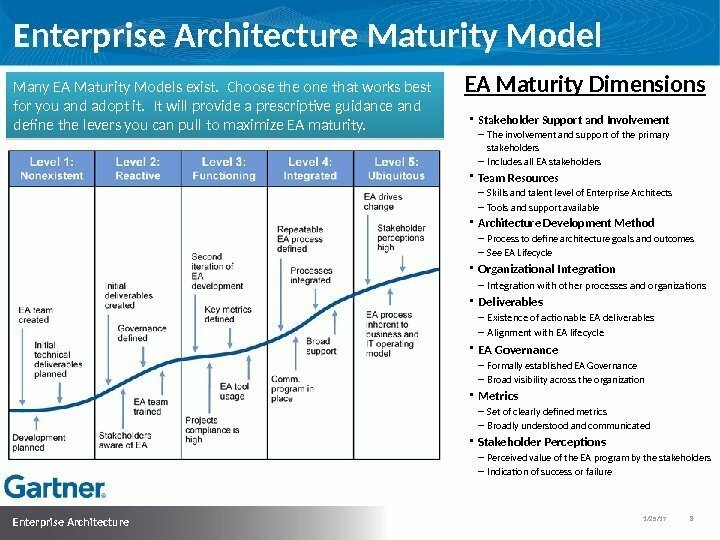 1/25/17 9 Enterprise Architecture Starting the EA Journey Gartner recommends establishing and evolving the EA program via six major phases. 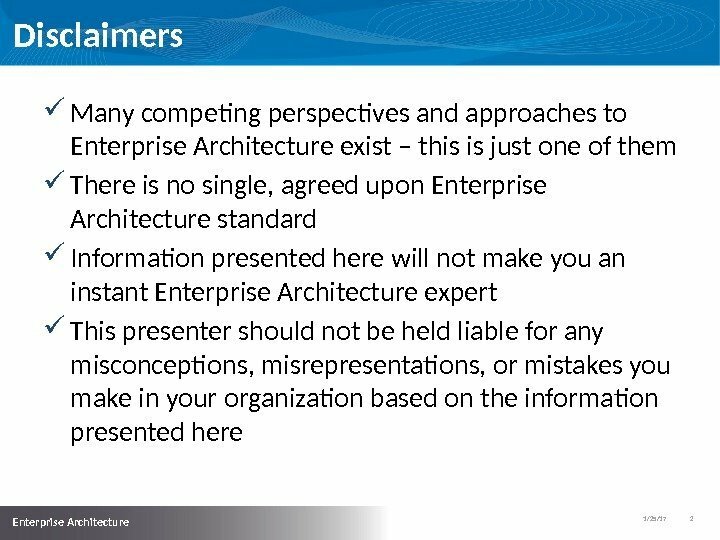 1/25/17 12 Enterprise Architecture Recipe for EA Program Success The need should be evident (IT inefficiencies, duplication of capabilities, etc. ) 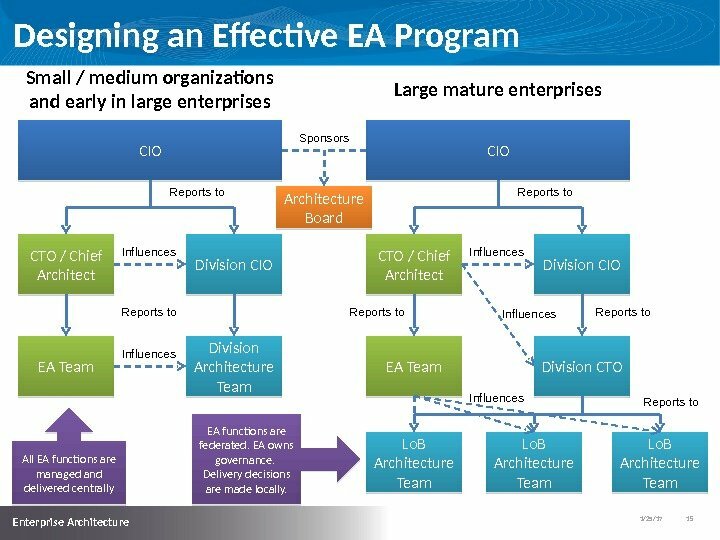 Ideally, this should be a C-level exec. 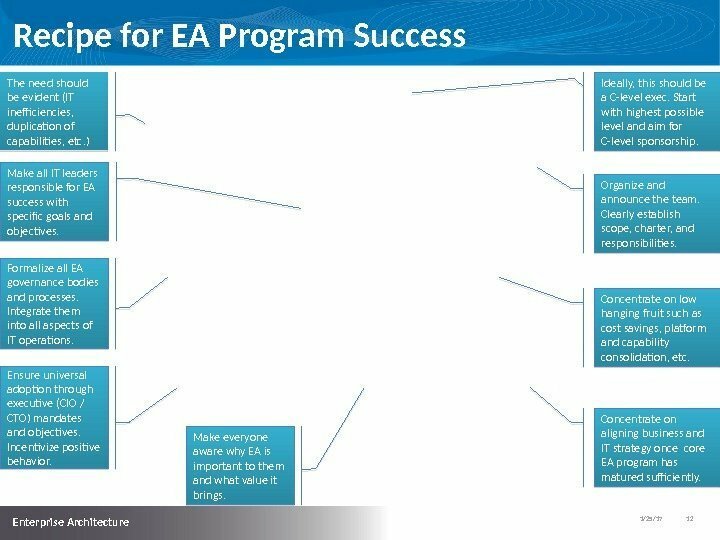 Start with highest possible level and aim for C-level sponsorship. Organize and announce the team. Clearly establish scope, charter, and responsibilities. 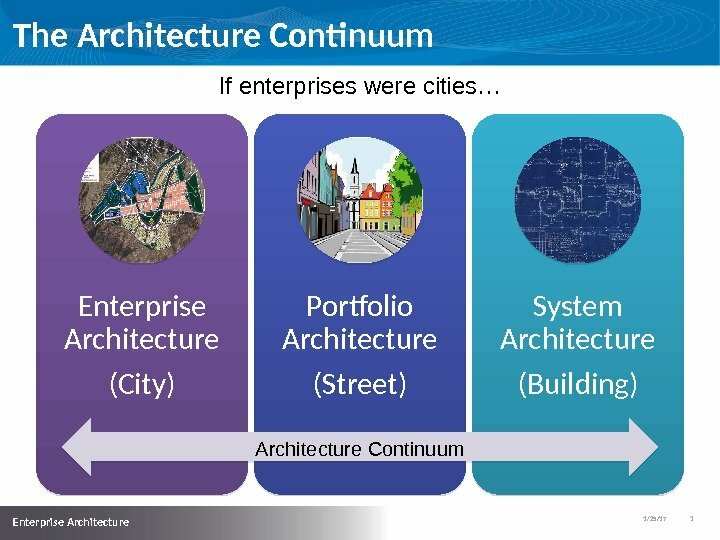 Concentrate on low hanging fruit such as cost savings, platform and capability consolidation, etc. 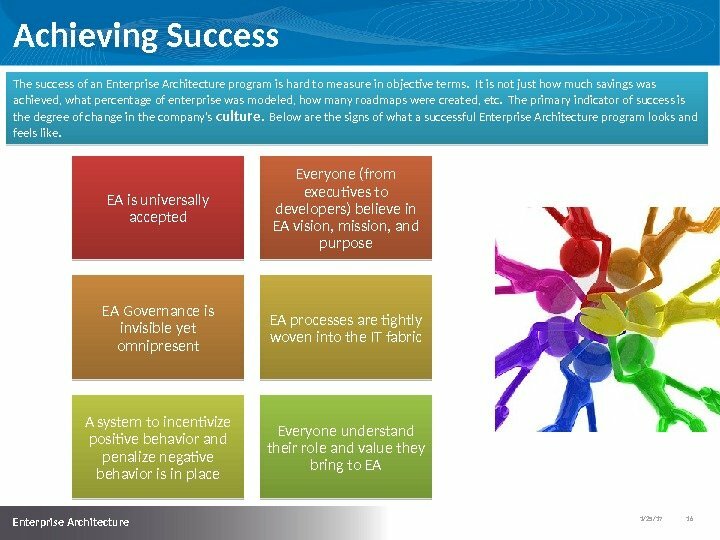 Make all IT leaders responsible for EA success with specific goals and objectives. 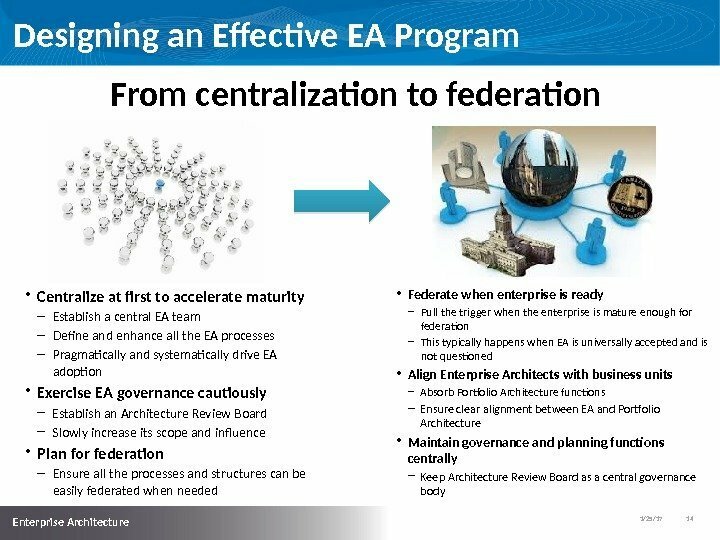 Formalize all EA governance bodies and processes. 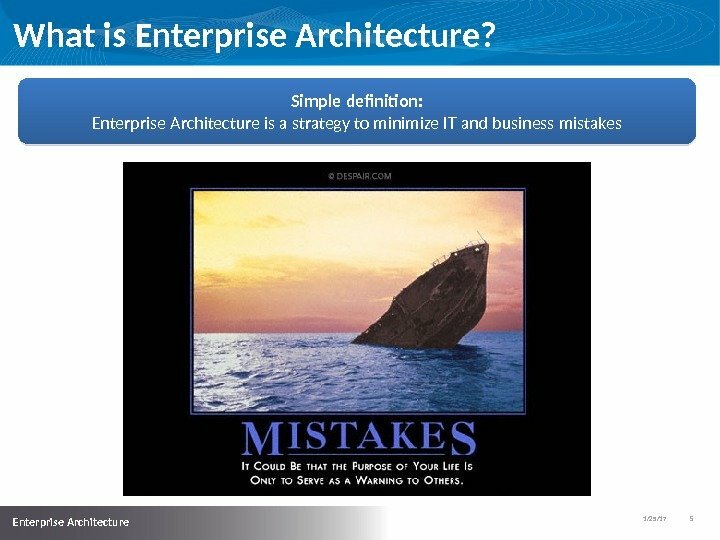 Integrate them into all aspects of IT operations. 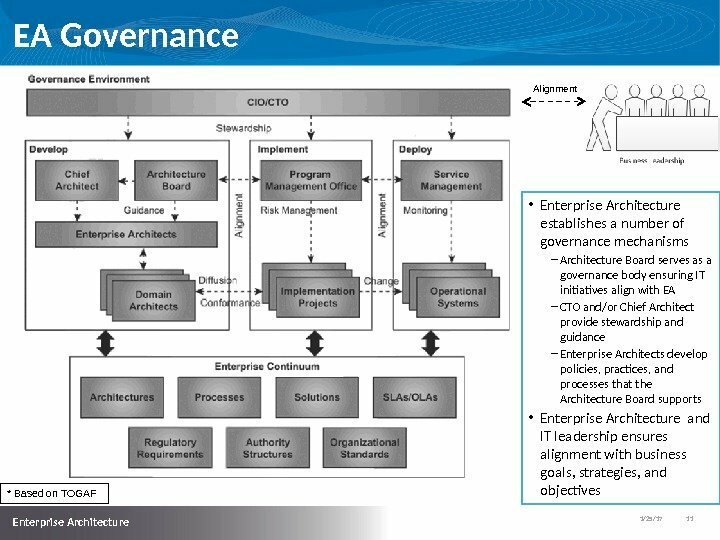 Ensure universal adoption through executive (CIO / CTO) mandates and objectives. Incentivize positive behavior. 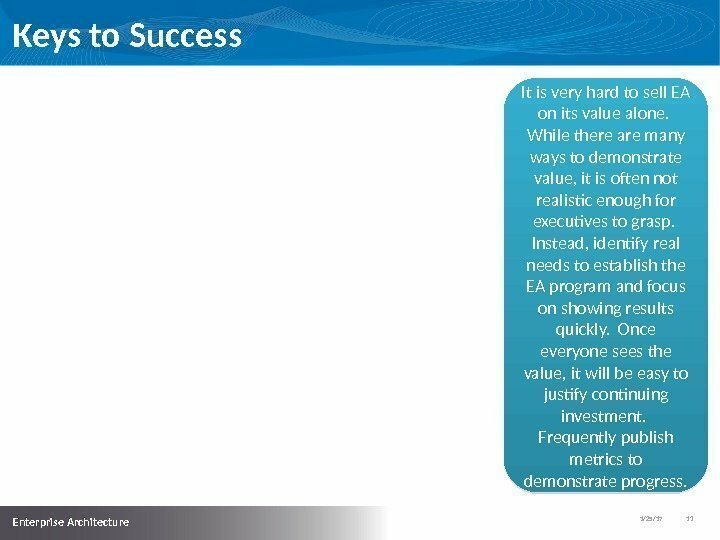 Make everyone aware why EA is important to them and what value it brings. 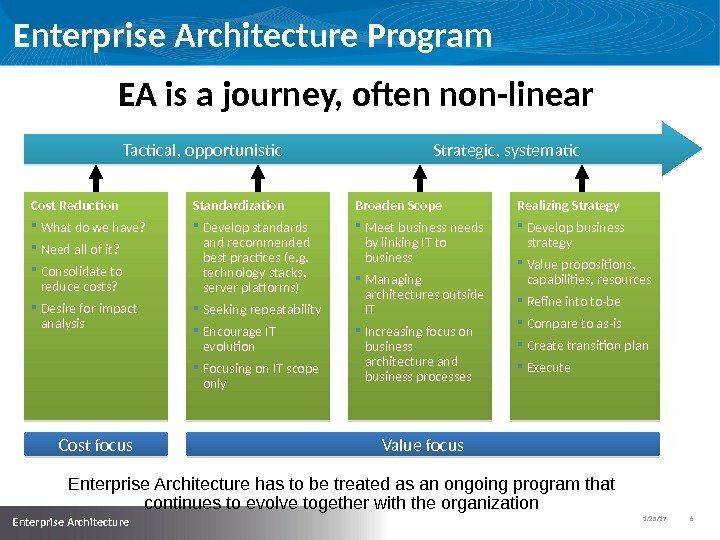 Concentrate on aligning business and IT strategy once core EA program has matured sufficiently. 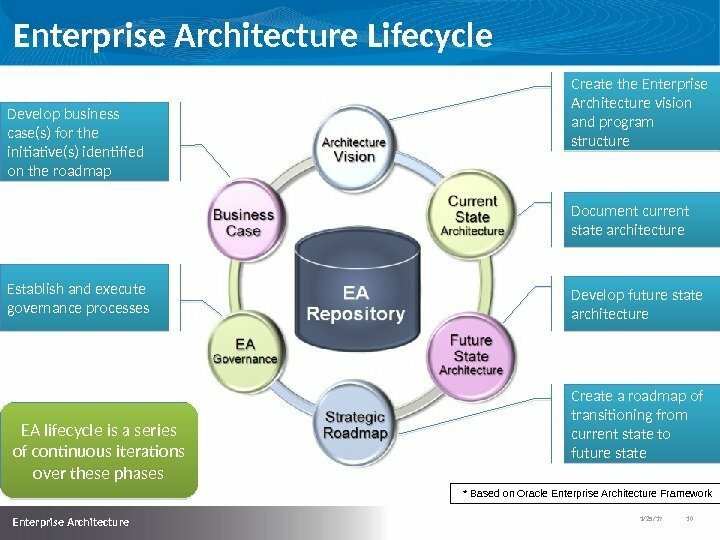 1/25/17 13 Enterprise Architecture Keys to Success It is very hard to sell EA on its value alone. 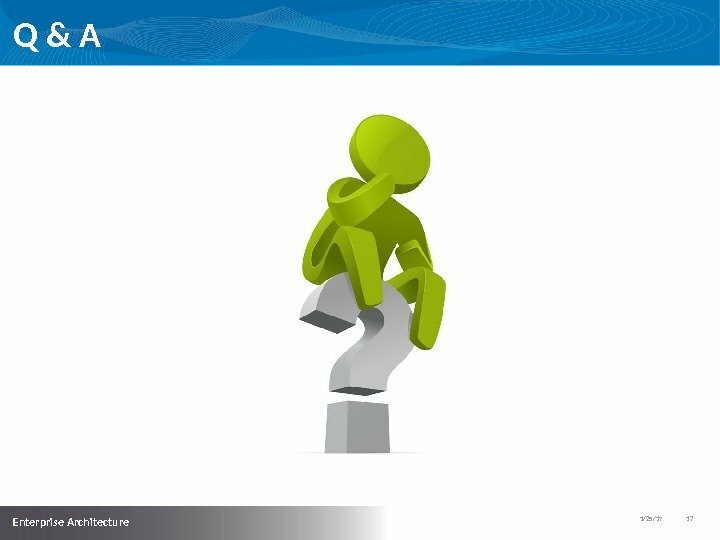 While there are many ways to demonstrate value, it is often not realistic enough for executives to grasp. 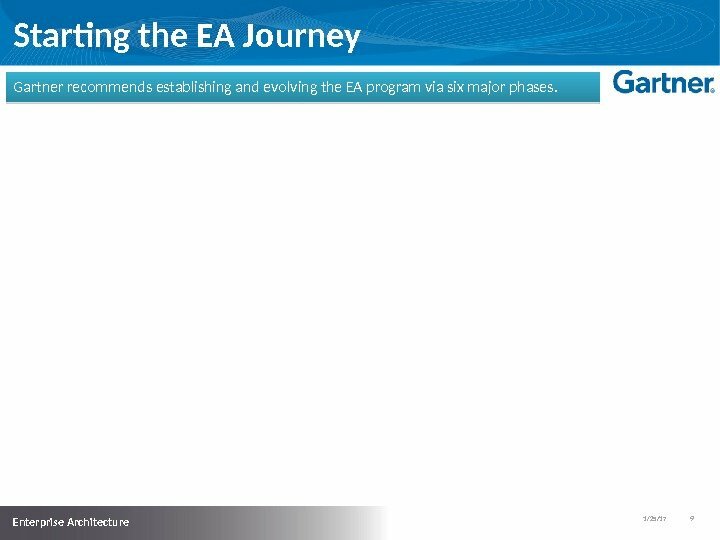 Instead, identify real needs to establish the EA program and focus on showing results quickly. Once everyone sees the value, it will be easy to justify continuing investment. 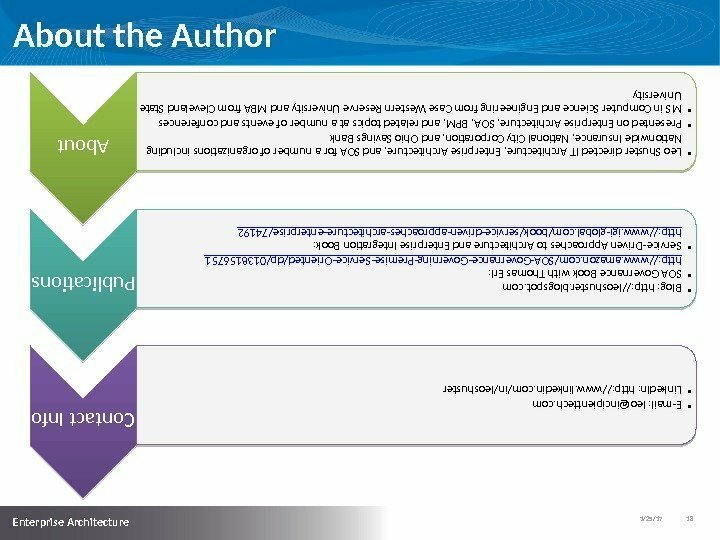 Frequently publish metrics to demonstrate progress. 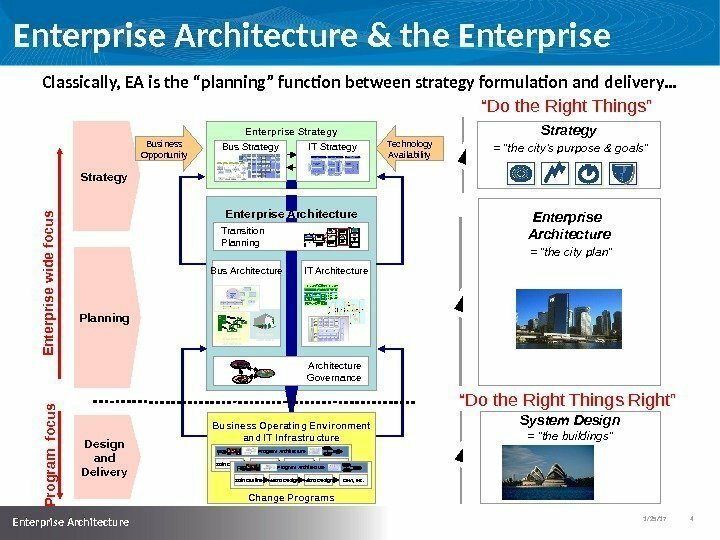 1/25/17 16 Enterprise Architecture Achieving Success EA is universally accepted Everyone (from executives to developers) believe in EA vision, mission, and purpose EA Governance is invisible yet omnipresent EA processes are tightly woven into the IT fabric A system to incentivize positive behavior and penalize negative behavior is in place Everyone understand their role and value they bring to EAThe success of an Enterprise Architecture program is hard to measure in objective terms. 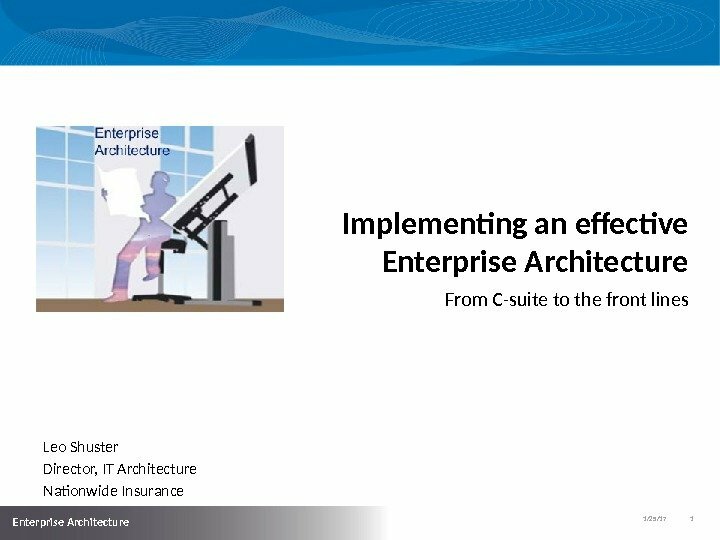 It is not just how much savings was achieved, what percentage of enterprise was modeled, how many roadmaps were created, etc. The primary indicator of success is the degree of change in the company’s culture. 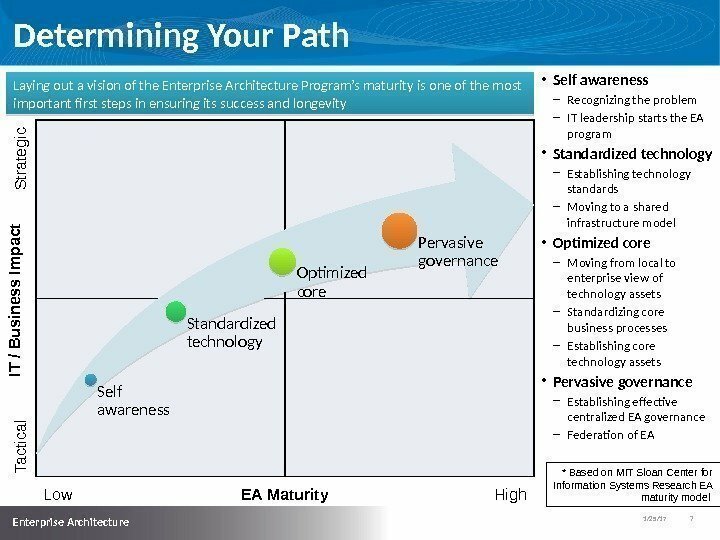 Below are the signs of what a successful Enterprise Architecture program looks and feels like.